Herron, Crowe and Pepper sound more like the ingredients for a medieval witch's brew, but Ronnie McFall hopes it may just be the winning recipe for Glentoran's midfield this season. His tasty trio in the middle of the park have been recruited in the off-season and have helped the Glens get off to a promising start to the campaign which they hope to carry on this evening at home to Newry City. They are currently sitting fifth after last week's point at Glenavon, where former Celtic midfielder John Herron made his first appearance and looked mightily impressive with a fine array of passing that had both sets of fans sitting up and taking notice. 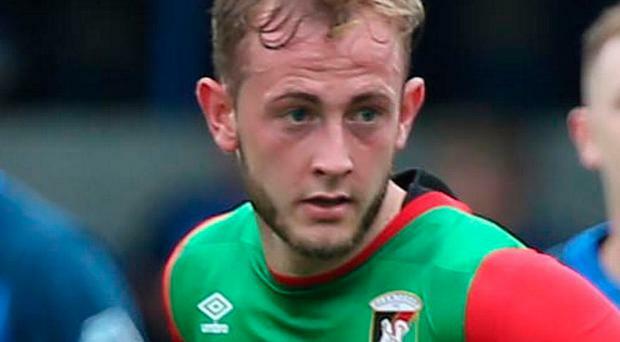 Former Morton man Conor Pepper, the Glens' Player of the Month, was missing through suspension, but Joe Crowe, who moved across the city from Linfield in the summer, was another man in the middle who caught the eye. "We're a work in progress, and you can see the progress we have made, but we will get stronger as the season goes on," McFall said. "We had to throw Herron in at the deep end at Glenavon because he's only been training for a couple of weeks after recovering from a hernia operation. "As the season gets on he'll get fitter. You could see his quality on the ball. "We missed Pepper's energy, but to go to Glenavon and get a point, you can't be too disappointed. "We've got midfield players who can play, Pepper, Crowe and Herron are all gifted footballers and that's what we're trying to do." But, impressive as they have been, the same maxim applies for McFall - those in possession of the shirt have to play well to keep it, and reputation won't play any part in it. "We've lost 13 players and brought four in, but the four we've brought in are quality, so the boys know if they don't play well they're out, because we have someone of quality to take their place," he added. By Steven Beacom The futures of Gary Smyth and Paul Leeman at Glentoran remain uncertain over a fortnight on from Mick McDermott's arrival as head coach at The Oval.